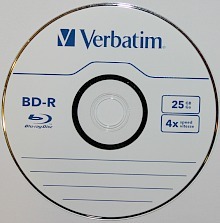 BD-R is the recordable Bluray disc format. This type of media is considered a write-once format because once the disc is full of content it cannot be erased and reused. It is comparable to the CD-R and DVD-R or DVD+R formats except that the Blu-ray recordable disc has substantially higher capacity and requires a blue-violet laser in order to read and record the disc. Therefore, it has the potential to be a very useful format, especially for the storage of large files such as very high quality digital photographs and digital video. However, because the format has not been adopted widely in the marketplace and because the longevity of the media is uncertain, it is best to wait a while until using this type of disc as a long-term storage format. Initially, Blu-ray recordable discs could only have one or two information layers for storage. The two data layer discs are known as dual layer discs. However, a couple of other variations have since been introduced. The three and four layer data storage discs are known as the XL versions. The three layer BD recordable is the TL (triple layer) and the four layer recordable disc is the QL (quadruple layer). The availability of these formats is not great, with a limited number of manufacturers producing the media. This is especially true of the BD-R XL/QL disc, which was introduced by Sony in November of 2018. This format is currently very difficult to purchase. 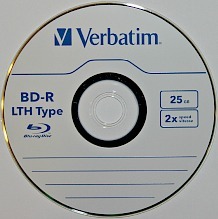 The BD-R XL/TL and BD-R XL/QL formats require a special burner in order to use these discs. The burners must state that they can accommodate XL Blu-ray recordable discs. Standard Blu-ray burners will not work with these higher capacity media. All in all, it is not anticipated that these two formats will be widely used and widely available in the future. 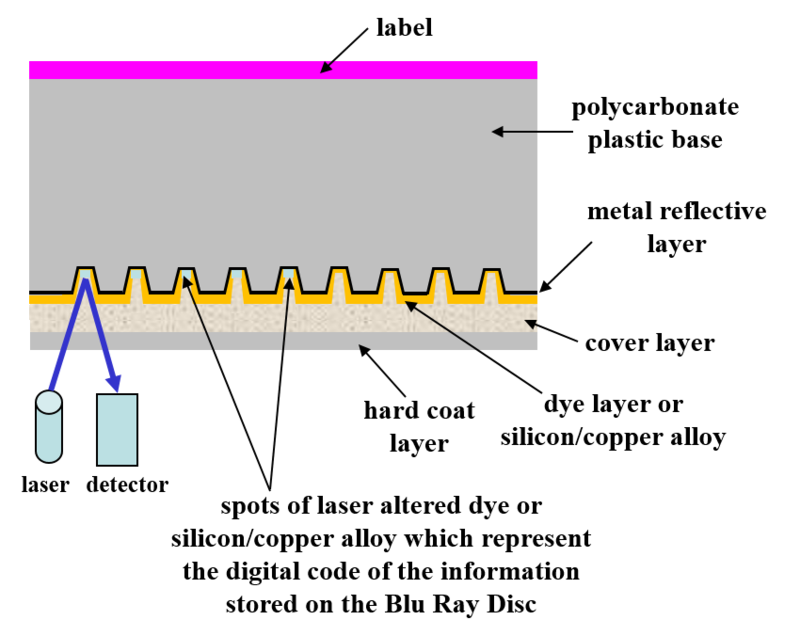 The structure of the single layer recordable BD is shown in the schematic cross-section of the disc below. Like in the read-only BD, the first layer, starting from the bottom or reading side of the disc is the hard coat layer and this is followed by a cover layer. The recording layer in these Blu-ray recordable discs is next. There are two types of BD-R technologies that are used to store data. The first is the LTH disc or Low-to-High format disc. A picture of this type of disc is shown below. This disc uses a dye to store the digital information as is done with CD and DVD recordable optical discs. The dye makes the disc look yellow when viewing the base side of the disc. This disc can also be identified by the labeling on the top surface of the disc. In the image, it is clearly indicated that the disc is of the LTH Type. The LTH recordable BD is less popular in the marketplace than the other technology that is used for this format. The "regular" recordable Blu-ray disc uses a silicon/copper alloy to store information. There are usually no special labels to identify this type of recordable disc, but the color of the base of the disc is usually brownish/blue in appearance. This disc seems to have better compatibility with burners than the LTH discs and might be a better choice when looking at this format for digital storage. As with other optical discs, a metal reflective layer comes next, that is sometimes gold in archival Blu-ray recordable media, then comes the thick plastic layer and then a label on the top of the disc. Blu-ray recordable discs should be handled and stored like CDs and DVDs. Avoid touching the disc surfaces, store in a regular size jewel case that is placed vertically on a shelf, do not write on the disc, do not place adhesive labels on the disc, and avoid warm and humid storage conditions. More specific advice can be found at the Blu-ray media storage and handling page of this website. In conclusion, because this format has not been adopted widely in the marketplace and because the longevity of the media appear to be very low, compared to other types of optical discs, it is best to wait a while until using this type of disc as a long-term storage format.